Acupuncture is a system of medicine developed in China over 3000 years ago. Veterinarians receive their Acupuncture training through the International Veterinary Acupuncture Society. This course gives a basic introduction to traditional Chinese Medicine, Acupuncture point location and action. The emphasis in equine Acupuncture is the treatment of the musculoskeletal system, however, Acupuncture can also treat chronic disease. Research has shown that stimulation of Acupuncture points causes a systemic reaction in the body. Acupuncture points are located on meridians, and it is these points that control the flow of energy. Dysfunction occurs when the energy flow is blocked or imbalanced, with one meridian containing too much energy and another too little. Imbalances in the meridians can originate directly from blockages in the meridian itself or indirectly from problems in the related organs. The goal of acupuncture is to remove blockages and balance energy flow throughout the entire body. The Bladder Meridian is one of the most often treated meridians on the horse. It is located along each side of the spine and contains some of the most important Acupuncture points in the body. For example, the Lung and associated Large Intestine Meridians may be affected in a horse recovering from a respiratory infection. These meridians run down the inside and outside respectively of the front leg, therefore, energy blockages in these meridians may cause front leg lameness. The Lung Association point is located on the Bladder Meridian immediately behind the shoulder blade and soreness at this point may cause resistance to tightening of the girth. The Large Intestine Association point is located on the Bladder Meridian in the Middle Gluteal muscle and soreness of this point may result in hind leg lameness. The use of Acupuncture to balance energy in the body is based on the Chinese principle of Yin and Yang. For the body to function at optimum levels it must have a balance of Yin and Yang just as the Earth needs a balance of day and night,summer and winter, etc. Traditional Chinese medicine does not consider viruses or bacteria as causes of disease, instead they recognize External Environmental Pathogens that imbalance our systems allowing these organisms to multiply. These pathogens can invade at the level of the meridians on the surface of the body or deeper in the body to cause serious disease. Example: Invasion of the Stomach Meridian by Cold would cause stiffness as Cold causes contraction. 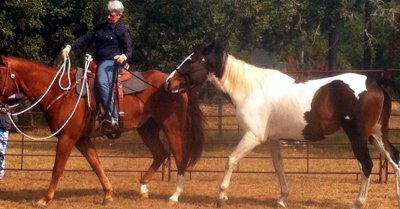 Since the Stomach Meridian runs over the stifle joint stiffness in this area early in a ride before the horse warms up might be the presenting symptom. Example: Heat invading the Lungs would present as a fever, cough with thick yellow discharge. These symptoms suggest a systemic or internal imbalance rather than a localized or external one. Minimal or no improvement after four to eight sessions for small animals and after two to four sessions for large animals. Results lasting only a few days after each treatment. A strong positive response to acupuncture produces improvement after four to eight sessions for small animals and after one to four sessions for large animals.